Please bring your own drinking water, as potable water is not available in the park. A tree fringed lake southeast of Lumby preferred by solitude-seeking swimmers and sunbathers. Listen for the echo that gives the lake its name. With clear turquoise colored water and excellent fishing for rainbow, lake trout and kokanee, Echo Lake is a popular regional recreation destination. Please Note: Camping, cabins, showers, washrooms, playground and water are available at Echo Lake Resort (within the park) and Cozy Cabins Nature Resort (just outside the park). Please refer to the websites of these businesses for a full list of services and facilities that they provide. Located southeast of Lumby off Highway 6 onto gravel road for 20 km. There are paddling, canoeing and kayaking opportunities at this park. 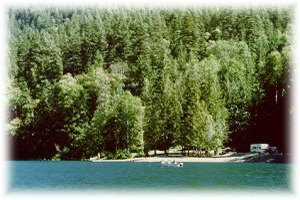 Canoe and boat rentals are available through Echo Lake Resort or Cozy Cabins Nature Resort. Echo Lake is a popular fishing lake in both the summer and winter season for rainbow, lake trout and kokanee. Anyone fishing or angling in British Columbia must have an appropriate licence. There is a boat launch available at Echo Lake Resort. Please Note: Camping, cabins, showers, washrooms, playgrounds and potable water are available at Echo Lake Resort (in the park) and Cozy Cabins Nature Resort (just outside the park). Please refer to the websites of these businesses for a full list of services and facilities that they provide. Picnicking is available at the park’s day-use area as well as Echo Lake Resort and Cozy Cabins Nature Resort.